I breathe in an assortment of aromas, the whiff of floral scent of potpourri; the intense smell of mix spices; the fragrance of shredded wood; the distinct odor of leather. 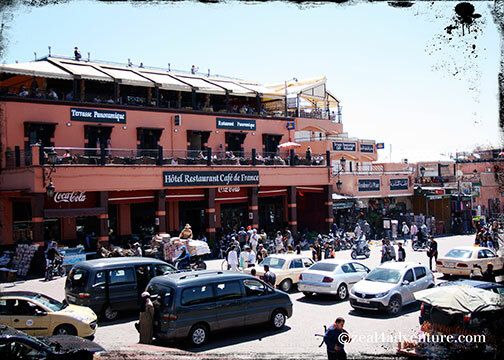 Marrakech also known as the “Red City” is a major city of Morocco, north of the foothills of the snow-capped Atlas Mountains. The city surrounded by blush colored walls, initially a fortress and a symbol of power, was constructed in the 12th century, the bricks used is a mixture of red mud and water from the Hazou plains. 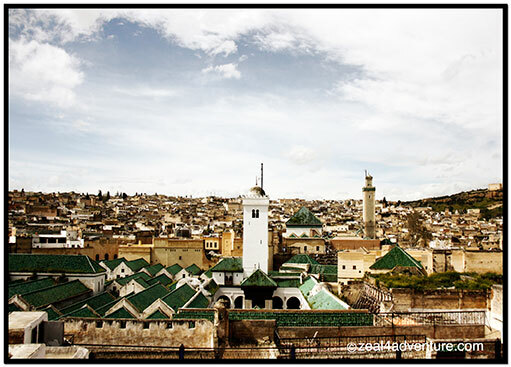 The city is divided into two distinct parts – the medina and the new European modern district called Gueliz or Ville Nouvelle. 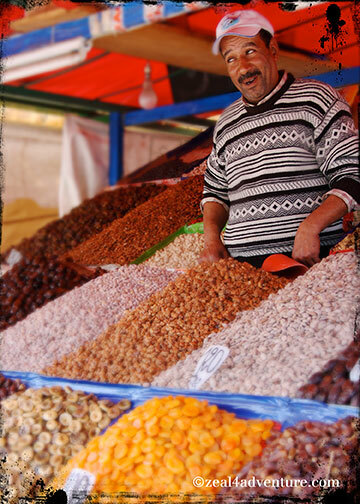 This post will be all about the historic city, its market and its famous square. 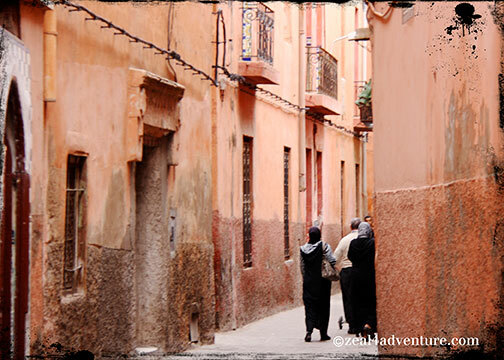 Get lost in the narrow, labyrinth streets of this ancient rose-hued city and let it take you back in time. 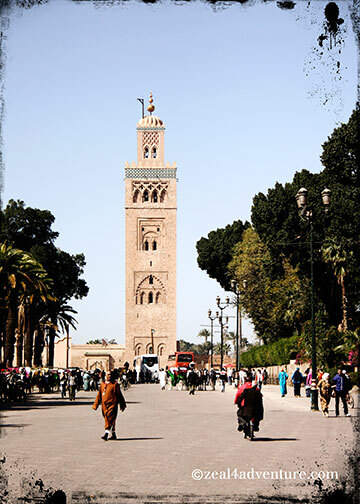 It is said that the minaret of Koutoubia mosque is the heart of Marrakech, but the soul of the city lies just 200 meters away, in the city’s market square and forum that has been in existence since its foundation. Part of the UNESCO World Heritage Site, it owes its fame to its size, its unique atmosphere, and for bringing history to life daily. 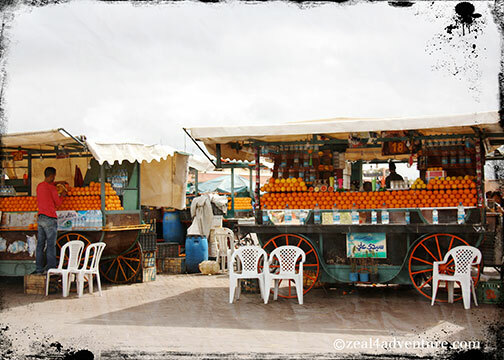 A medieval circus of musicians, dancers, snake charmers, story tellers… share the square with the fruit and juice stands. Chaotic yet in tune with the din of drumbeats and enthusiastic hollers. 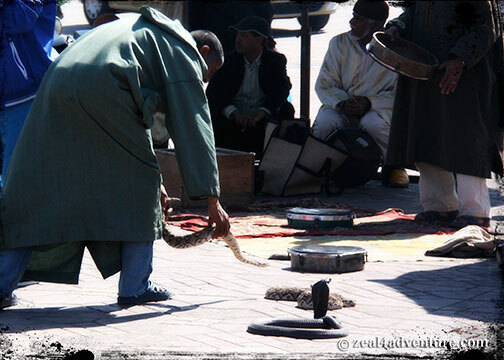 The way to experience it is to be among it all but the best way, I found out, is to watch the hustle of activities and be entertained by Djemaa el-Fna’s daily performers from any of the peripheral cafes and restaurants’ upper terrace. It will be a show you don’t want to miss. The show doesn’t peak until sundown when the square has a different life. 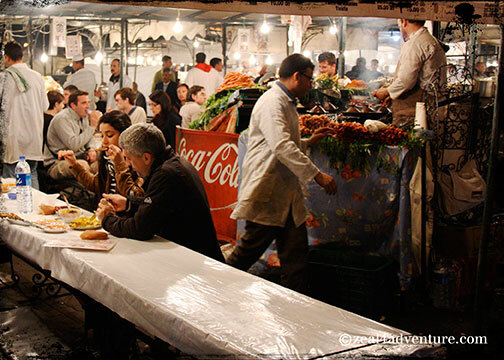 Rows of street stalls under giant white tents are set up each night not only for the tourists but are, in fact, local food jaunts, as well. 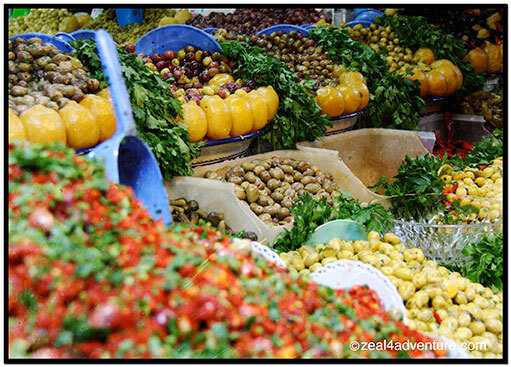 Food is prepared hot and fresh along the countless stalls serving authentic favorites one must have when in Morocco. 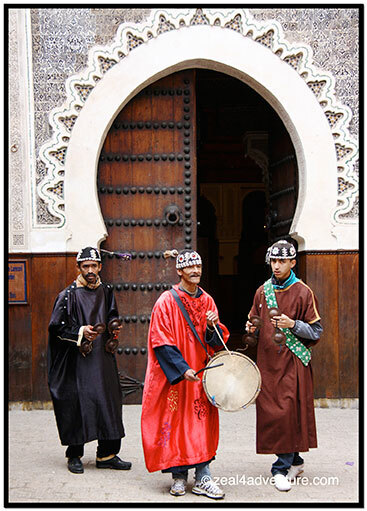 Head out one night and eat like the locals do and be serenaded with the sounds of live Moroccan music. Troupes of Andalusian or Gnaoua musicians perform as part of a dinner show around the square. 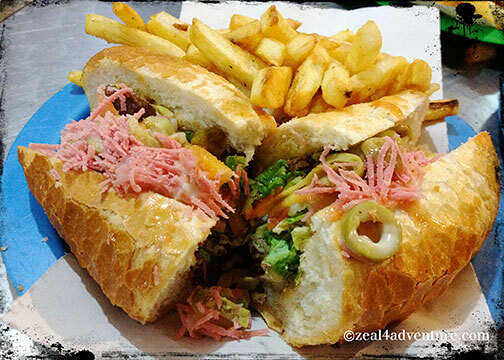 If the confusion seems to be overwhelming, look for small eateries serving these sandwiches they call bocadios. 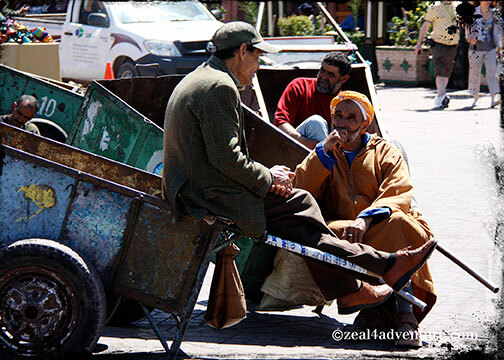 Amazing stuff found in the corners of the medina away from the disarray – it helps though if you can speak Moroccan or French. 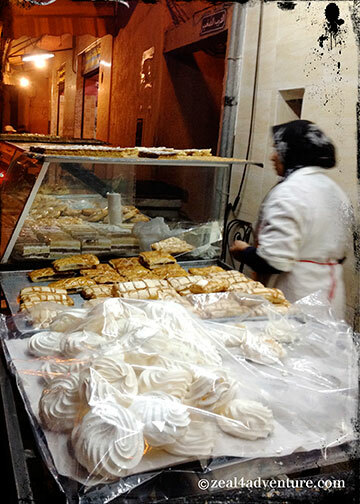 And just outside, a lady sells wonderful Moroccan sweets. Perfect for dessert. 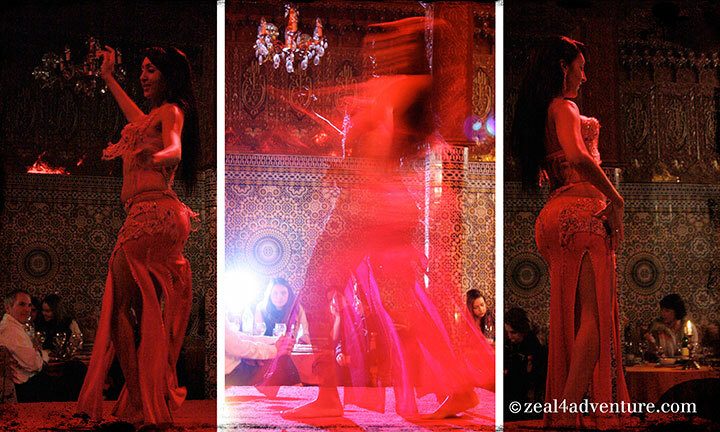 Or escape to an evening of belly dancing, for a different kind of entertainment. 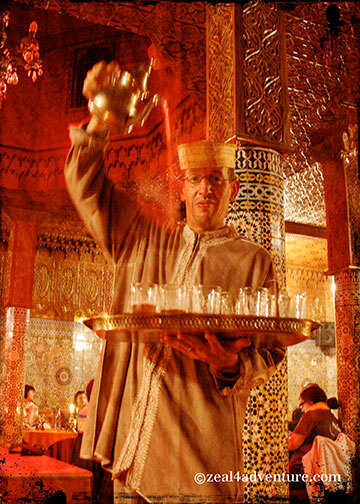 The proper way to pour Moroccan mint tea, as performed by our very gracious waiter. 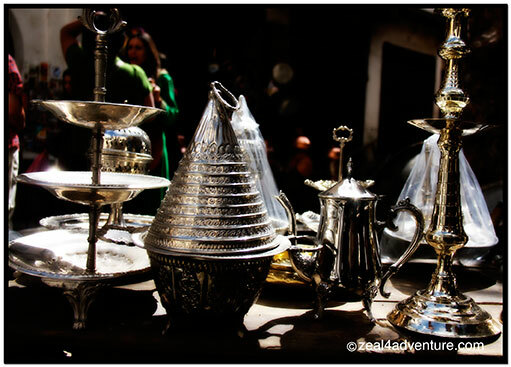 Marrakech has the largest traditional market in Morocco and it is so easy to spend your dirham at the seemingly endless maze of souks inside the medina. 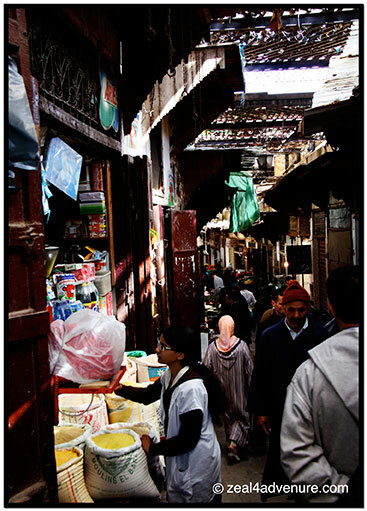 A network of souks begins on the north edge of Djemaa el-Fna and ends at the Ben Youssef Madrasa, comprising of alleyways of local shops full of character. 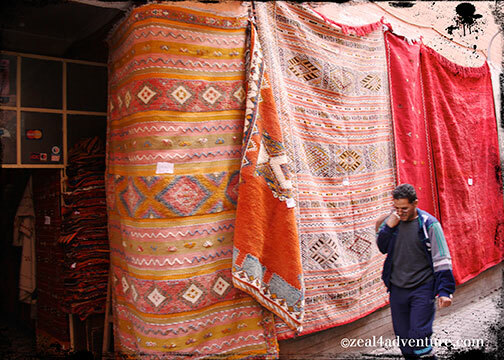 The further in you venture, the more fascinating they become from souks touting everything to the (more) sedate choice boutiques. 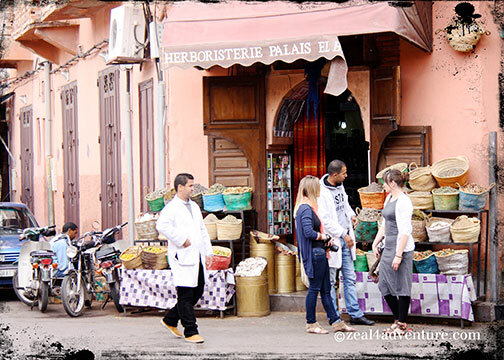 or merely listen to herbalists sell you miracle cures for the aging, wander and get lost, then get help from a bunch of boys playing in the street… all these are part of the fun when exploring Marrakech’s medieval souks and winding streets. 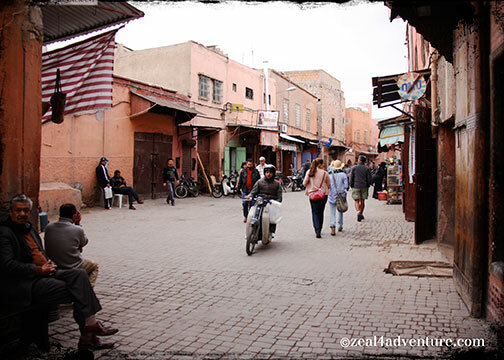 Do all these because if you have not gotten lost, if teenagers have not offered to help you find your way out, if they didn’t hassle you for a tip, if you have not been greeted and lured by jovial merchants in five different languages, you have not experienced Marrakech. 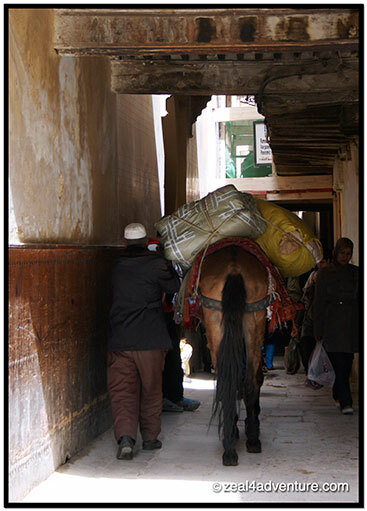 donkeys transporting people and things, and not to mention the vibrant colors of rugs, potteries, spices… all happening simultaneously. 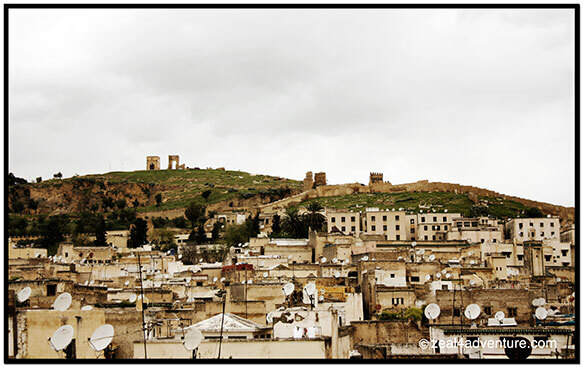 The old city of Fes stimulates all the senses. Rashid, our guide picked us up right after breakfast at Dar Labchara. 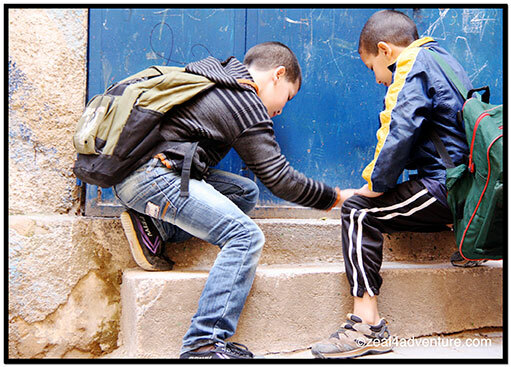 To discover the city, an official guide is essential. 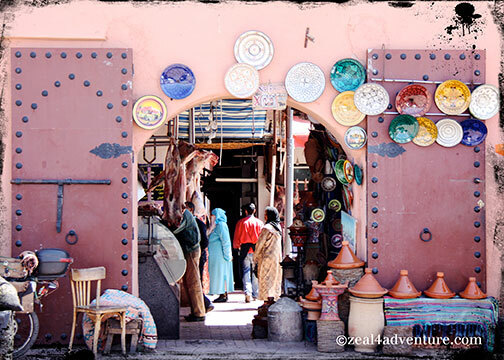 Ours took us around the medina, passing narrow alleys housing hundreds of merchants and craftsmen selling an assortment of products from dates to musical instruments. 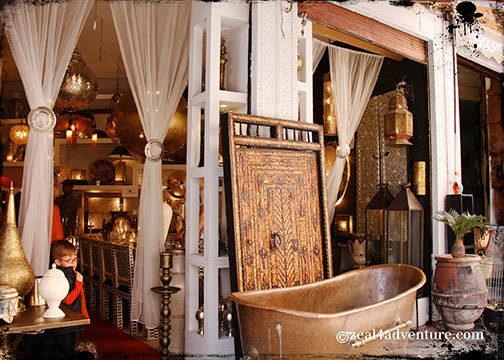 Fes el Bali (Fes the old) is our baptism of fire into an exotic medieval world. 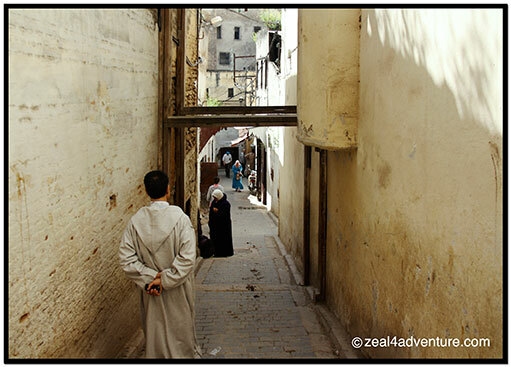 Not much seemed to have changed within this walled city with over 9,000 alleyways. 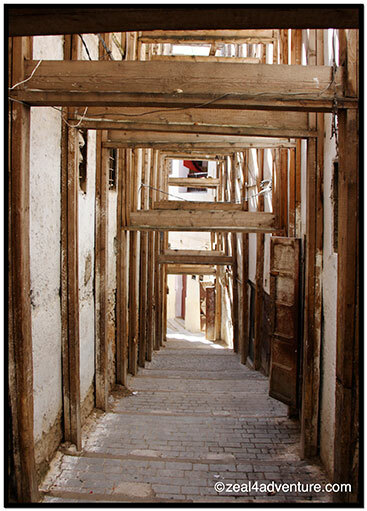 Fes el Bali is the old medina where most cultural sights are located; its labyrinth of narrow winding alleys is almost impossible to negotiate without getting lost. 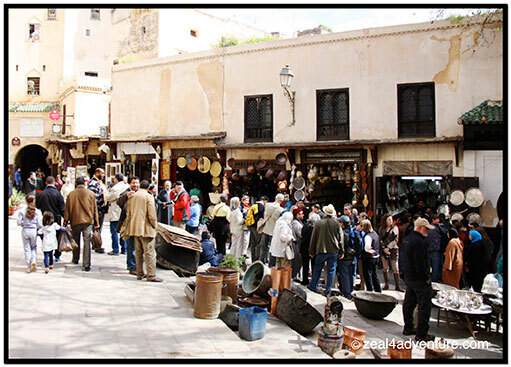 It is a car-free urban space and a UNESCO World Heritage Site that spans 1,300 years of Moroccan heritage. 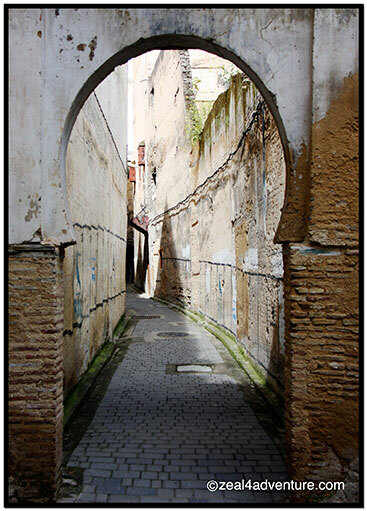 It is the central business where 150,000 people living inside the wall – a cocktail of Berbers, Arabs, and Africans in hooded djellaba cloaks, red tarboosh hat they call fez and open heel babouche slippers – come and go, much like it was 1,300 years ago. 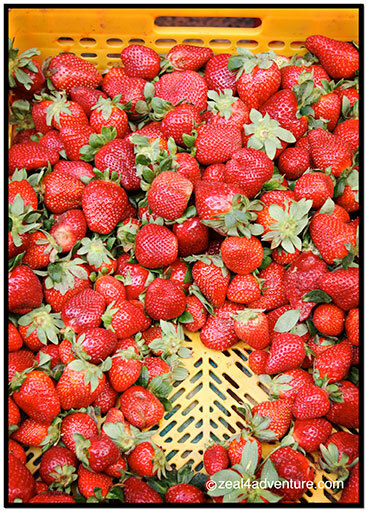 drooling over a variety of Moroccan food specialties, admiring vegetables I don’t get to buy in my part of the world, and devouring some beautiful, crunchy strawberries in season. 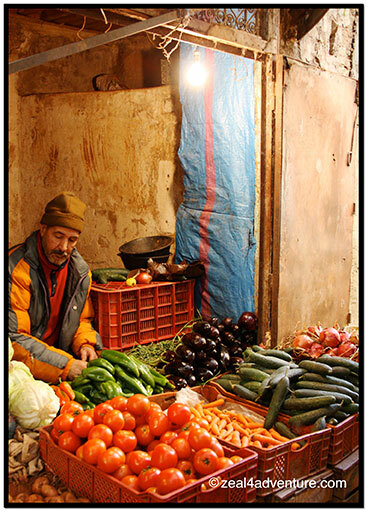 Chaotic, overwhelming, stimulating, similar, in a certain way, to our wet market yet distinctly Moroccan in every way. 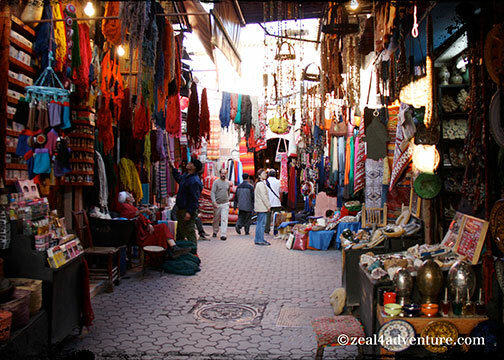 Morocco is a shopper’s delight and weaving through the maze like narrow lanes led us to various outdoor bazaars called souks. 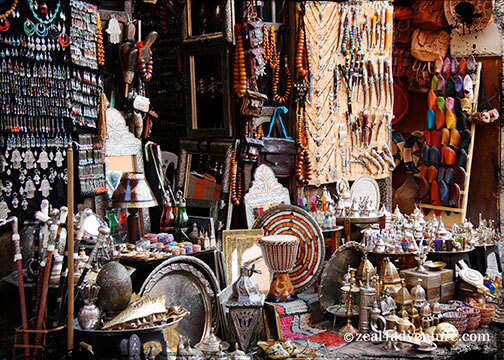 They consist of tiny stalls displaying objects ranging from colorful scarves to buckets of olives. 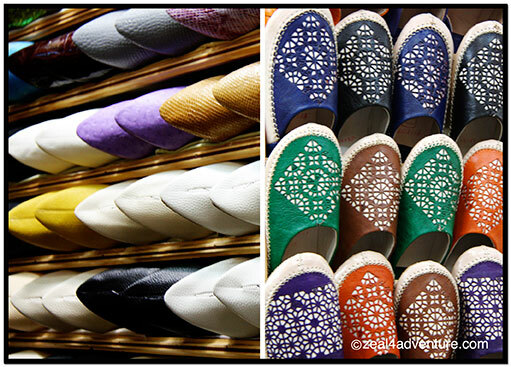 It is an integral part of the medina. It is where the locals buy their essentials. 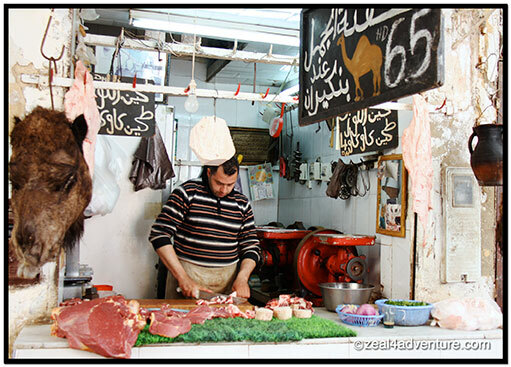 the spice souk, the carpenter’s souk, the leather souk, the slipper souk, the dyer’s souk… all within a bigger souk. 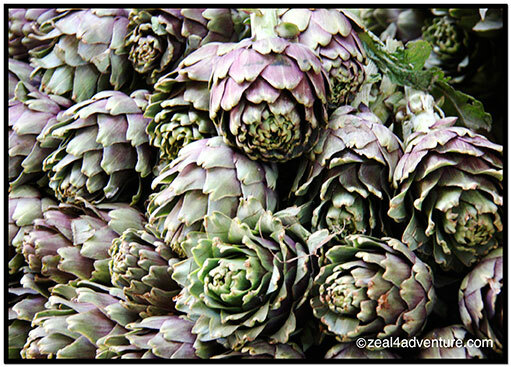 At every turn, we found ourselves in a new souk typically named after what they are selling. 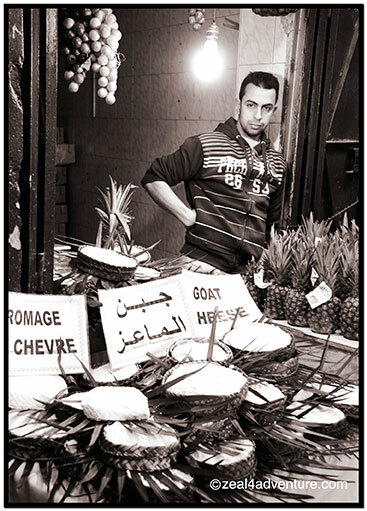 One such souk was at the Seffarine Square. 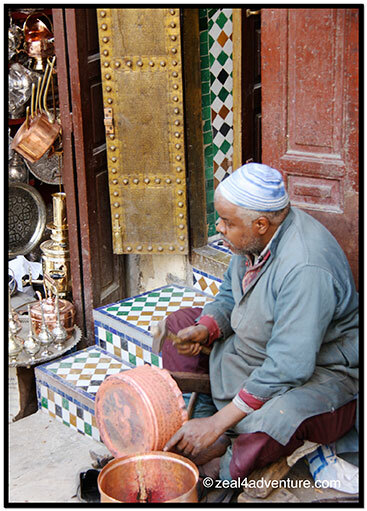 A delightful square that is the center of Fes’ copperware trade surrounded by artisans hammering sheets of metal into shape: huge cauldrons, kettles, pots, plates and the likes. 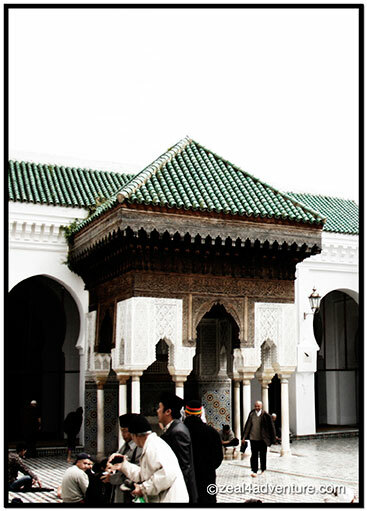 On one side lay the Kairaouine library, on the other, the Seffarine Madrasa. 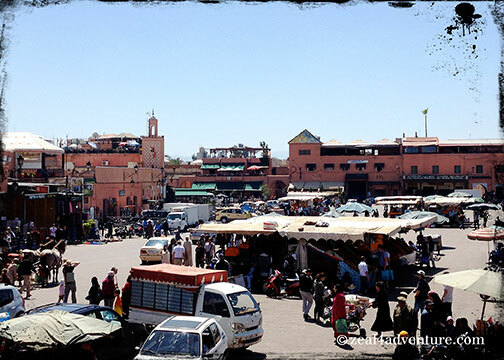 The open space is a refreshing break from the confining tight corners of the medina. 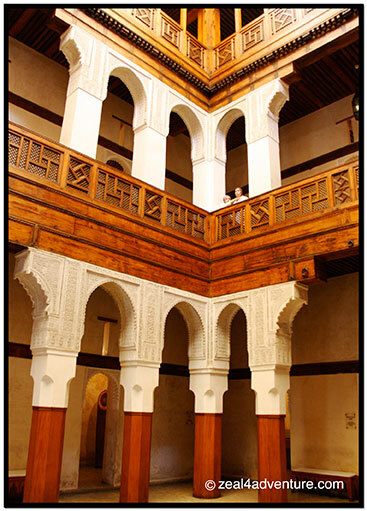 Built in AD857, the University of al-Karaouine is perhaps the oldest university in the world. Not open to non-muslim, we had to content ourselves with viewing its beautiful architecture from the entrance. Rashid took a shot from my camera for a peek at one of the dozen horseshoe arches in the mihrab (prayer niche). A better view of the university can be had at any rooftop balcony nearby. 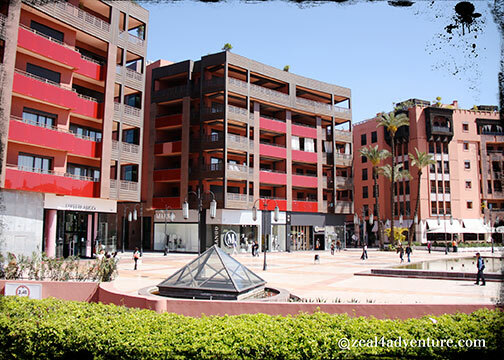 Rashid then lead us to another lovely square where you will find the Fondouk el Nejjarine. The beautifully restored building used to be a fondouk or a caravanserai, a roadside inn built to shelter men, goods and animals along ancient caravan routes. 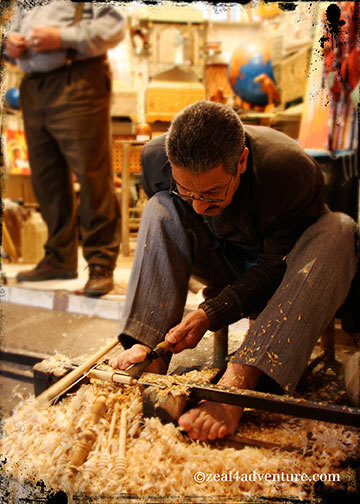 It is today a museum of wooden arts and crafts. 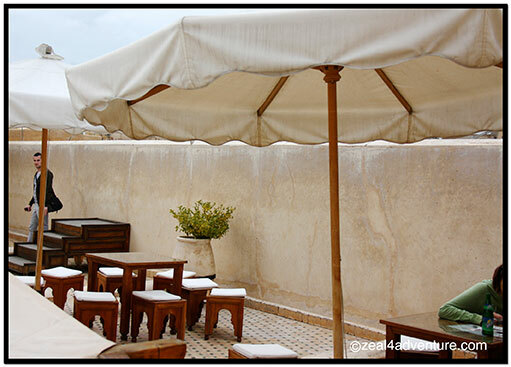 It has a nice little rooftop café boasting of outstanding views of the city. 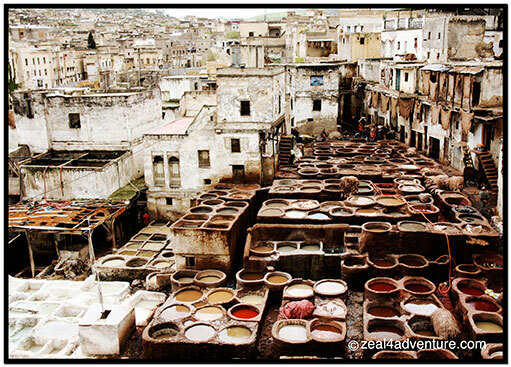 A visit to Fes will not be complete without seeing a tannery. And at the Chounara Tannery, the smell of lye, acidic pigeon excrements and dyes drifts around the rooftop balcony, we were given sprigs of mint to mask the stench. workers balancing between stone vessels arranged like honeycombs filled with vibrant dyes. 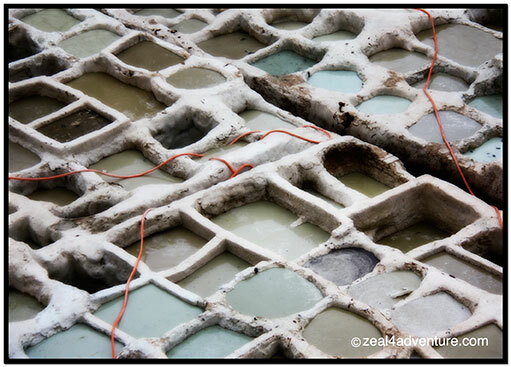 They soak the hides in the acidic solution and then transfers them to another vat containing dyes such as henna, saffron, or mint. It is a rare visual spectacle and experience not to be missed at any cost. 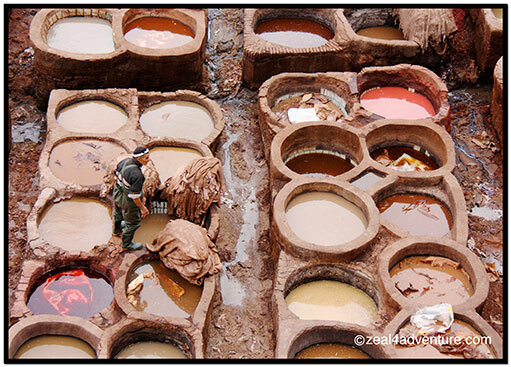 Now purchasing high quality leather products produced from these tanneries is another thing. 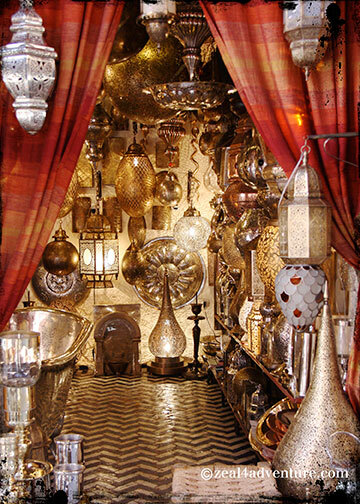 In fact, shopping in Morocco is an entertaining experience worthy of a post all its own.